Morocco, a North African kingdom adjoining the Atlantic Ocean and the Mediterranean Sea, where the cultural blend is renowned by its Berber, European, African and Arabian cultural influences. Morocco most beautiful and oldest city Marrakesh, where Markets and its Medina’s are vibrant buys and wonderful. The capital Rabat’s Kasbah of the Udayas is very famous with the ancient history of 12th-century royal forts. 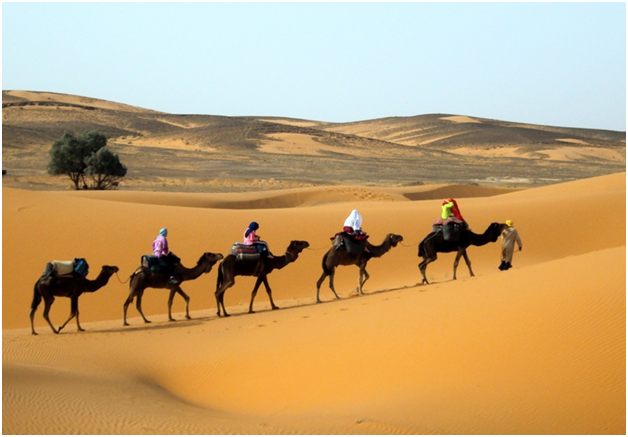 The deserts of Morocco are amazingly warm and best for trekking. But ironically, most of the area of it are far from the vast stretches of sand dunes where you may only discover "the golden sand". When one speaks of the desert, one has in mind images of immense sand dunes, as far as the eye can see, mirages. 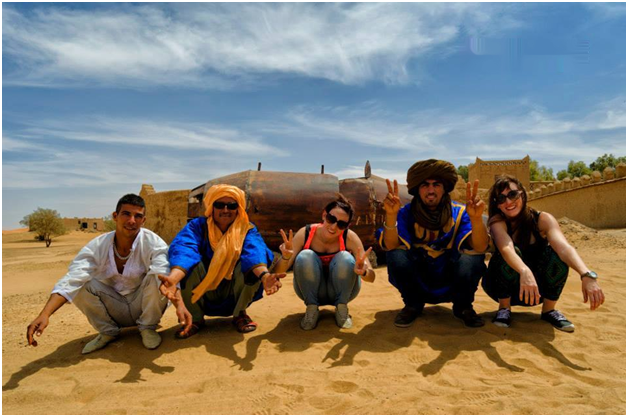 There are only two Ergs, the famous erg Chebbi, next to Merzouga, and erg Chigaga, and further in south, near M'hamid. 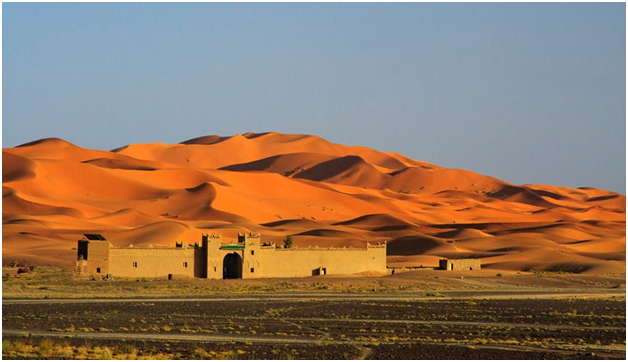 If Chebbi dune is the highest and the most extensive then also Chicaga is more isolated, since it takes about 45 minutes of 4x4 to reach it, while Merzouga is actually "at the edge of the road". To go to the dunes is to fulfill a dream whether you're a sports enthusiast or a trekker, or a little less athletic. While rolling in the sand to drive on the high dunes, we replay movies and comic strips, letting ourselves go to the pleasure of a descent fast and safe journey. But there are many more deserts in Morocco, whether the deserts of stone surround the oases of the Drâa valley, the high plateau of the Atlas, almost untouched by many visitors, exceeding twenty centimeters high. I prefer these deserts because of the high sand dunes, their landscapes are more diverse, always bitter, dry, often dark, like the black summits of Jebel Saghro, or our oasis, right next to Serdar, where the fossils enshrined in schists and black marbles are projecting. Under the devastating sun, a heavy late-spring canard, these plains, where hundreds of thousands of years ago skipjacks and small fish wriggled in a sea that has disappeared now, you will get a very special experience. Moonlight there, in the Hamada of the Draa, in the primordial times, passed gazelles and elephants. It was perhaps not a lush jungle, but it was a green, rich area, whose inhabitants have left evidence in rock engravings. Today, the river Drâa will disappear under the sand, not being able to flow freely to the Atlantic, absorbed by a thirsty land. The oasis of Drâa is a wealth. They dot the biggest palm grove in the world, islands of lush green, almost aggressive, planted along the course of the river, in a yellow and red landscape that extends to the Atlas. To discover the desert well, you have to give some time. It takes more than an excursion of a few hours so that the body begins to dry up, to feel the effects of aridity and dust so that the eye is made to the sparkling luminosity. You have to spend a few nights, to fully enjoy a sky full of stars as you see nowhere else. And above all, it takes a few days, so that the "nothing" of the desert produces its effect. Little by little, the little details that surround you, a simple grass, a little insect that whirled a few minutes, and that you would never have noticed, takes on an unimagined importance. This is the magic effect of the desert, to open you to the world. Tonight, there was a hunting in the desert, After a few days in the desert, when we return to the oasis, what could pass to the eyes of the tourist for a few blades of grass Dusty, muddy trough, becomes a spring meadow, and a river. Every year, I have the chance to discover new places and share them with those who can dedicate time desert. Departing from Marrakech, it takes 4 days to really go into the desert, and that is a minimum. On the other side of the road, one goes for two or three hours in the dunes. The summer period is rather to avoid unless we particularly like the heat. It seems obvious, but it's very hot in the desert, summer. So - especially if you are traveling with children - take a lot of water, and plan small trips. It will include sunscreen with a very high degree of protection, which is not easily found in Morocco, moisturizing cream for the lips, hands, and feet, and possibly for the hair. As for clothes, light and covering (you do not bronze in the desert ... you protect yourself), and for the evening, a good sweater, a pair of socks, because after sunset, it is cold. Side shoes, I prefer to avoid flip-flops and other sandals very open, except when I am in the dunes, precisely. But elsewhere, it's full of small stones, thorns, it stings, and you have to protect the feet. However, in the evening, it is a true delight to enjoy a pair of comfortable slippers! Sunglasses and chic as I have very sensitive eyes, I always carry two pairs of sunglasses, "in case". Finally, the essential accessory is the chèque, must remember to keep it in Morocco Holidays. This long light cotton scarf will protect from everything, and start dusting. Moistened with water, it pleasantly refreshes the head and neck. Reached to the Tuareg, it protects effectively in the event of a sand wind. Placed on the face, it avoids the flies during the siesta (there is "nothing" in the desert, but there are always flies). And in the evening she makes a cushion or a head rest.